Detroit is a major metropolis in the US state of Michigan that has had a profound impact on the world. From the advent of the automotive assembly line to the Motown sound, modern techno, and rock music, Detroit continues to shape both American and global culture. The city has seen many of its historic buildings renovated, and is bustling with new developments and attractions that complement its world-class museums and theaters. Let’s start from the Downtown. It is Detroit’s center of life. Downtown Detroit is bordered to the south by the Detroit River, which divides the United States and Canada. The downtown sits on the riverfront; while the rest of the city expands north, east, and west from downtown. Downtown Detroit is unique: it’s the city’s business district on an International Riverfront. It has ornate buildings, sculptures, fountains, the nation’s second largest theater district, and one of the nation’s largest collection of pre-depression era skyscrapers. Downtown Detroit also features the Renaissance Center, including the tallest hotel in the Western Hemisphere, the Detroit Marriott, with the largest rooftop restaurant, Coach Insignia. Midtown – the city’s cultural center, just north of downtown is home to several world-class museums and galleries. The area is also home to some great 1920s architecture. It is probably the most unique destination in Detroit. East Side – this part of the city includes much of the riverfront, Belle Isle, the historic Eastern Market, Pewabic Pottery, and more. Southwest Side – home to many of the city’s ethnic neighborhoods, such as Mexicantown and Corktown. The area is mostly known for its cuisine in these ethnic neighborhoods; however, it is also home to many historical sites, such as the abandoned Michigan Central Station, Tiger Stadium, and Fort Wayne. West Side – home to many historic neighborhoods, the University District, and much of the infamous 8 Mile. Hamtramck-Highland Park – the cities of Hamtramck and Highland Park are surrounded by Detroit except where they border each other. Hamtramck is sometimes referred to as “Poletown” because of the large Polish population. Highland Park is home to many historic buildings and neighborhoods. Greektown is probably Detroit’s most famous neighborhood. It has an endless amount of Greek restaurants and is home to Greektown Casino. Corktown is Detroit’s oldest neighborhood. It was settled by Irish people from County Cork, hence the name Corktown. Many historic landmarks are found in the neighborhood, such as the Michigan Central Station and the remnants of Tiger Stadium. Mexicantown is the fastest growing neighborhood in Detroit. It is famous for its Mexican cuisine, which is evidenced by its vast number of restaurants. Woodbridge is a historic district home to many architecturally significant houses, most of which are Victorian-style. The neighborhood was one of the few that were not affected by Detroit’s decay a few decades back. Renaissance Center, also known as the Ren Cen, is a group of seven interconnected skyscrapers whose central tower is the tallest building in Michigan and the tallest hotel in the Western Hemisphere. It has the world’s largest rooftop restaurant that can be reached by a glass elevator ride. 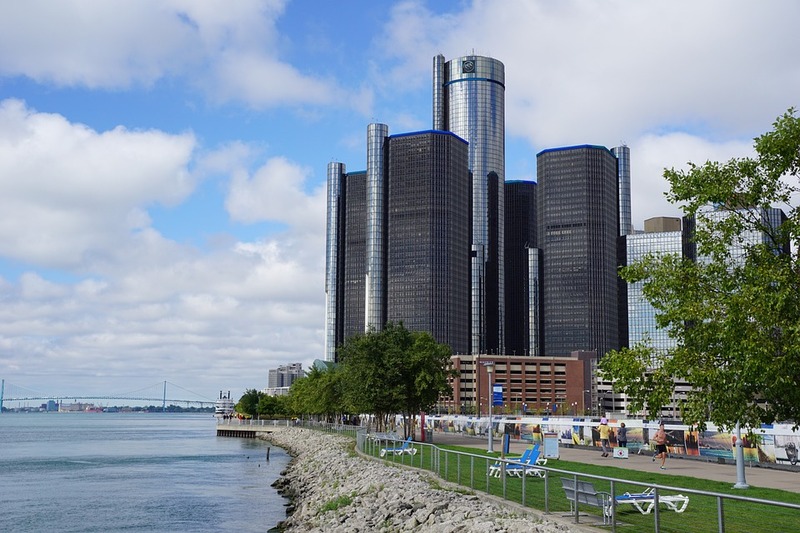 The headquarters of General Motors, is also here on the Detroit International Riverfront. A historic Art-Deco building designed by Albert Kahn in 1928. 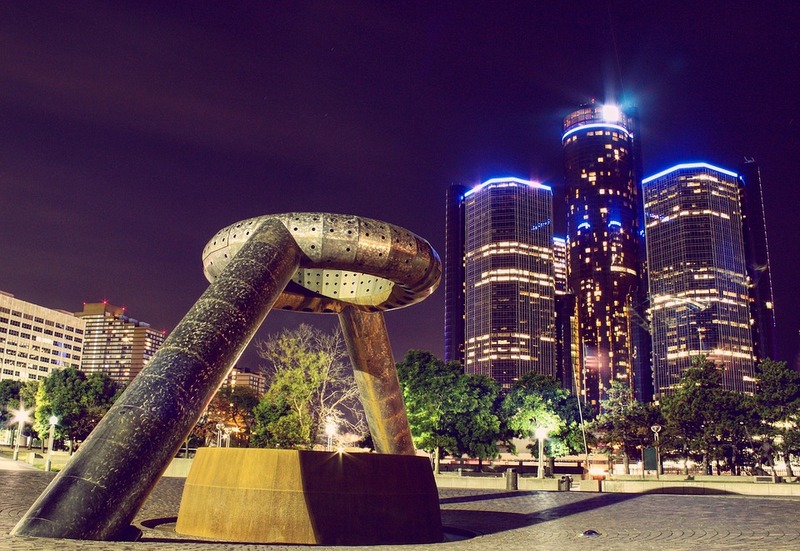 It has been called Detroit’s largest art object. A bold example of Art Deco architecture, including art moderne designs. The interior, decorated with mosaic and Pewabic and Rookwood tile, is a must-see. A renovated architectural gem built in 1928. America’s best surviving example of Roman Baroque architecture. Detroit is known for its enormous, impressive but decaying relics of American industry and wealth, and thus has much potential for urban exploration. Charles H. Wright Museum of African American History – holds the world’s largest permanent exhibit on African American culture. See: Midtown-New Center. Detroit Institute of Arts – one of the most significant museums in the United States. It has an art collection worth more than one billion dollars. See: Midtown-New Center. Detroit Historical Museum – covers the history of Detroit and its industries. Historic Fort Wayne – a fort built in 1845 to defend Detroit from Canada. It also houses the Tuskegee Airmen Museum. Belle Isle is Detroit’s premier park. The 1000-acre park lies in the river between Detroit and Windsor and is reached by bridge. It offers swimming, a nature center, yacht club, rowing club, conservatory, golf course, maritime museum. The park hosts motor racing, off-shore boat racing, concerts and small athletic events. The park, which is larger than Central Park in New York City, shared the same designer. Rouge Park is the largest park in Detroit. The 1200-acre park includes a golf course, model airplane field, swimming pools, hiking and mountain bike trail. Campus Martius Park is Detroit’s main urban park. Several skyscrapers surround this park and the adjacent Cadillac Square Park, which was made in 2007 to increase the amount of park space. The park is also home to several monuments, such as the Michigan Soldiers’ and Sailors’ monument, a Civil War monument. Hart Plaza is a park on Detroit’s riverfront. It offers great views of the city’s skyline and also has several monuments, such as Dodge Fountain and the Joe Louis Fist. Grand Circus Park is a park that connects the financial district to the theatre district. It is also surrounded by many skyscrapers. The park also has many monuments and statues. Detroit is the birthplace of American electro/techno music, with Juan Atkins, Kevin Saunderson, and Derrick May all hailing from the area. Although other cities around the world have picked up Detroit’s torch and carried it further in some ways, Detroit is still a great place to dance and see the masters at work. The Detroit sound is the sound of the world. It is shaped by Detroit’s unique past, its cultural diversity, its energy and its future. Detroit’s public information campaign, “The World is Coming, Get in the Game” features an online tour of this music scene. Unlike some cities, there is no central entertainment district (Greektown only partially counts) and many up and coming groups play at venues scattered throughout the area. Detroit’s Night Life includes a multitude of clubs throughout the metropolitan area. Detroit is home to over 80 galleries, with artists hailing from around the world. Detroit’s art scene is vibrant, bold, and colorful. Artists are attracted to Detroit due to its abundance of raw, under-utilized industrial space and its inspiring environment of pre-depression era buildings. Ann Arbor – Home to the University of Michigan, and a thriving downtown full. Canoeing is a favorite pastime on the Huron River, available through Metro parks near Ann Arbor. The city boasts the number #1 rated Ann Arbor Street Art Fair which attracts over 500,000 attendees from across the nation each July. Dearborn – Home of Ford Motor Company, The Henry Ford (the Henry Ford Museum & Greenfield Village). A large historical and entertainment complex, and the Automotive Hall of Fame. Dearborn has the second largest Middle-Eastern population in the world, with mosques being a common sight and a wide selection of Middle-Eastern food and shopping. Grand Rapids – Michigan’s second largest city. With a skyline filled with construction cranes, many believe Grand Rapids is Michigan’s future. With a great, clean downtown area and the city’s proximity to Lake Michigan, Grand Rapids is a grand experience waiting to happen. Lake St. Clair and the St. Clair River – Waterfront activities and living are among the luxuries of the metropolitan Detroit area. Experience cruises and boating on beautiful Lake St. Clair. Enjoy the charm of a small town lifestyle in a major metropolitan area in and around Lake St. Clair’s Anchor Bay. Royal Oak – Home to the beautifully landscaped Detroit Zoo, Royal Oak is a LGBT friendly suburb outside of Detroit which boasts a classy night scene with exciting dining and a diverse avant-garde bar culture. Detroit’s climate is continental, therefore subject to rapid change and a variety of weather. Winters are snowy and very cold, with an even colder wind-chill factor. Snow usually doesn’t remain the entire winter. Spring and fall are normally pleasant but colder temperatures will likely creep in during late fall and remain during early spring. Summer is rather short, but often times it is hot and muggy with sometimes strong to occasionally severe thunderstorms. As with most other urban areas in the US, precautions should be taken when out after dark: stay in groups; do not carry large amounts of money; and avoid seedy neighborhoods. 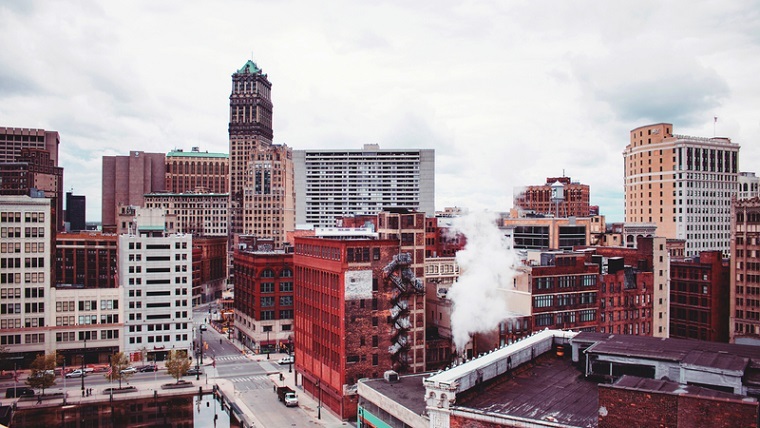 The overall crime rate in downtown Detroit is below the national average, and crime has declined significantly, but the city is still among the most dangerous in the country. While locals have been known to exaggerate the threat, the potential for violent crime is real. Visitors unfamiliar with the area would be wise to avoid residential neighborhoods, particularly at night. Downtown Detroit can also get a bit rough, especially late at night when the bars clear out. That being said, if you exercise common sense and don’t go looking for trouble, you’ll be fine. Contrary to some people’s perceptions, downtown Detroit is generally well-policed and the safest part of the city. Crimes sometimes occur, but exercising common sense will go a long way toward keeping you and your valuables safe. Stick to major freeways when possible and try to avoid smaller streets through unfamiliar neighborhoods. How you carry yourself can easily keep you from getting mugged. Sporting events, festivals and other large public events are always heavily policed and very safe. Always use caution and ask around before going to a particular venue. People at record stores, guitar shops, “cool” clothing stores, and the like often visit and know which venues are easy to get to and reasonably safe.